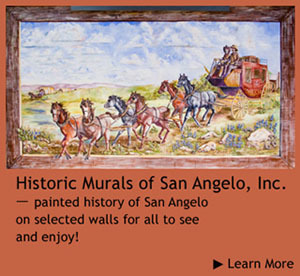 This mural celebrates the life of the well-known San Angelo writer of western novels, Elmer Stephen Kelton. Painted by Stylle Read, the focal point of this mural is Kelton’s portrait that is much like the popular photograph on the writer’s website homepage. Kelton was born on April 29, 1926, the first of four sons born to his parents, Buck and Bea Kelton. He grew up on the McElroy Ranch in Andrews County, Texas, and graduated from Crane High School in 1942. He attended the University of Texas at Austin in 1942-44 and 1946-48, earning a B.A. degree in journalism. He served two years in the U. S. Army, 1944-46, including combat infantry service in Europe. Kelton earned two Bronze Star medals, the European African Middle Eastern Campaign Medal, Combat Infantryman’s Badge, Victory Ribbon, Army of Occupation Ribbon and two Overseas Service Bars while assigned to Company G of the 104th Infantry. He met Anna Lipp during the post-war occupation of Linz, Austria, where he ran the Displaced Person's Office. They married in 1947 and had two sons, Gary and Steve, and one daughter, Kathy. Kelton lived and worked in San Angelo, Texas, until his death on Aug. 22, 2009. He is buried in Lawnhaven Memorial Gardens in San Angelo. The author of more than 50 western novels, Kelton attributed his interest in cowboys and western writing to his family's rich ranching history. In this mural, 14 of his books, "Hot Iron" (1956) through "Texas Standoff" (2010), are stacked high between an old typewriter and a Texas Ranger's badge. There could be several other stacks of books, too – including the series "Tales of Texas" (three books), "Texas Traditions" (nine books) and "Sons of Texas" (three books), as well as five compilations of short stories and 13 non-fiction books. Kelton used his personal typewriter for many manuscripts, but did use a word processor and computer for his more recent works. The Company A badge represents the nine-book "Texas Rangers" saga that he wrote featuring two young Texas Rangers, Rusty Shanahan and Andy Pickard. Living in San Angelo, Kelton knew much about the Fort Concho Buffalo Soldiers and wrote specifically about them in his books. In one story, "The Wolf and the Buffalo," freed slave Gideon Ledbetter finds himself with no land, no money, and no means to make a living. He is drawn into the army and soon becomes locked in a battle with a Comanche warrior. The buffalo soldiers, bronc-riding cowboy and Indian hunting buffalo painted in this mural reflect the reality of life as described in so many of Kelton's books. Usually writing in the evening, Kelton worked day jobs for 15 years as farm and ranch writer-editor for the San Angelo Standard-Times, five years as editor of Sheep and Goat Raiser Magazine, and 22 years as associate editor of Livestock Weekly, from which he retired in 1990. The mural's windmill, colorful skies, and cowboys punching cattle through the prickly pear and rough terrain are the same as the word-pictures that Kelton drew so often in his newspaper and magazine articles. Among his most celebrated novels are "The Time It Never Rained" (1973), "The Man Who Rode Midnight" (1987), "Buffalo Wagons" (1957) and "The Good Old Boys" (1978), which was adapted for a television movie starring Tommy Lee Jones in 1995. 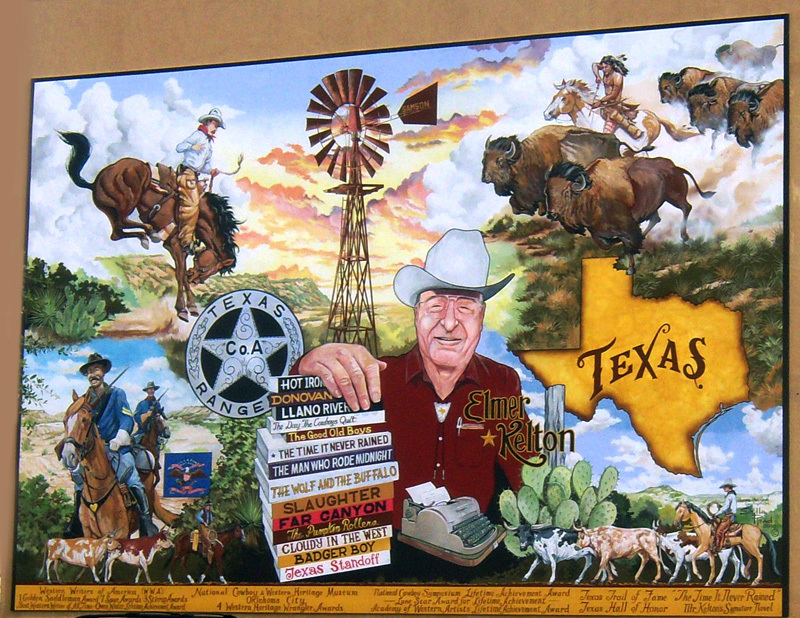 The titles of many of his writing awards are painted along the bottom of the mural, but the Western Writers of America pretty well summed them all up by voting Elmer Kelton the “greatest western writer of all time” in 1995.